Laughing Gull is the most common gull at the shore in summer - they have a black head and make that laughing call. Their head turns white in winter except for a little smudge of black here and there. They winter down south in Florida. 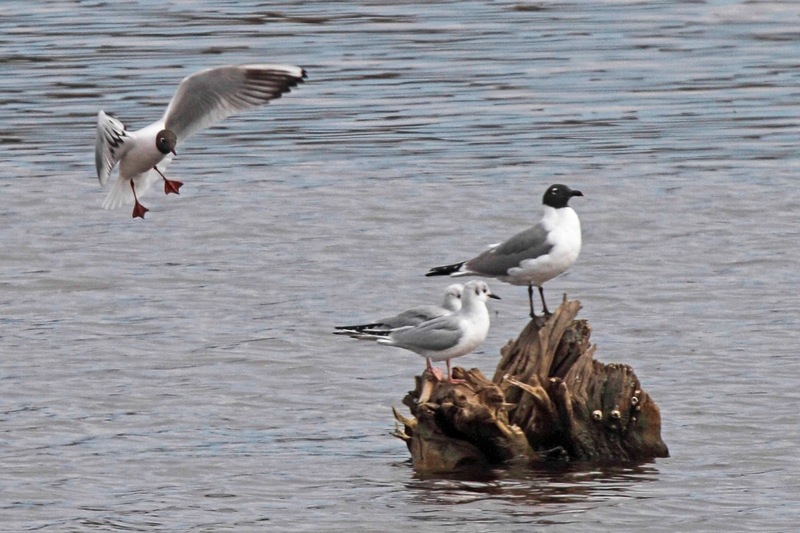 Bonaparte's Gull is the most common gull in winter. They also have a black head in summer, but we rarely see that since they spend their summers far north of here. We see them with white heads and a few "dots" of black. Black-headed Gull as the name suggests has a black head too. We rarely see these gulls except during their northbound migration. They winter far south of us and nest far north. Little Gull also has a black head in summer and, as the name suggests, is smaller than the other gulls. It is even more rare than Black-headed Gull in migration. Birders go nuts over this gull (truth be told, it is cute). 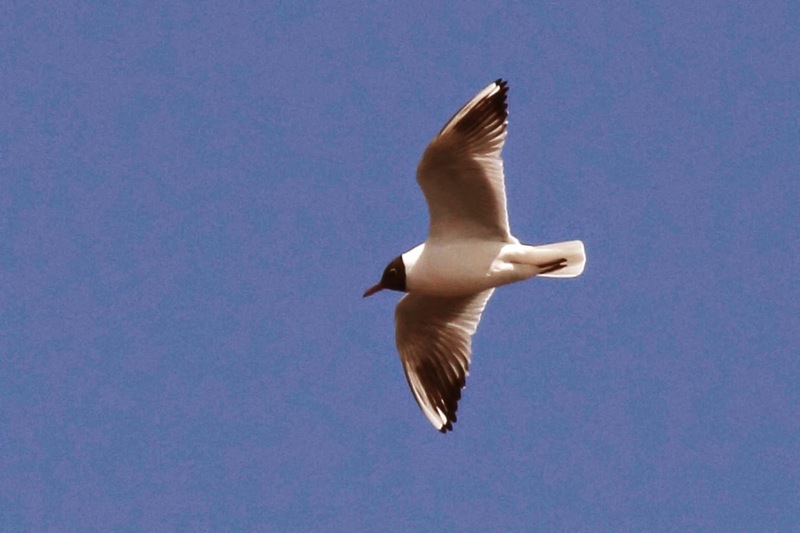 Black-headed and Little Gull were both seen in Cumberland County earlier this week so I went down after work in an attempt to photograph them. The Black-headed Gulls were reported to actually have the black head which would be good for the photo. In typical fashion, I showed up 5 minutes too late to see the Little Gull. It had already flown away. Sigh. But I did get a few photos of Black-headed Gull. The only way to tell this gull apart from Bonaparte's and Laughing is by the dark tips under the wings and the red feet. Are you kidding me? It's not that easy to see those features when you are looking at a hundred gulls but somehow these birders do it. I got pretty good at spotting this guy since he had the black head and black wing tips. Here is another photo that shows 3 species together. Can you tell which is which? I just gave you the field marks for Black-headed gull so that one should stand out. The other 2 species are Bonaparte's and Laughing. While I was patiently waiting to see if the Little Gull would return, the resident Bald Eagles got off of their nest to chase a Cormorant that had a big fish. 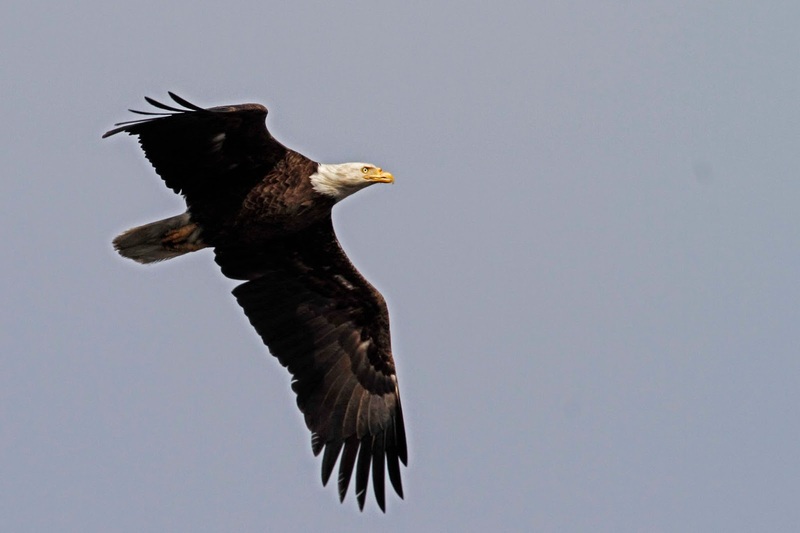 Eagles are notoriously lazy hunters. They would rather grab a free meal from a Cormorant than find a fish on their own. I snapped a few shots and noticed something odd about one of the eagles. You'll need to zoom in to see it. Check out the top of the bill - it is totally deformed. I sent out a note to the Jersey Birds list and was told that this is probably an injury caused by a fight with another eagle. Wow, don't mess with eagles!